Associazione Artistica Culturale “A Rocca” is an NGO based in the Northern part of Sicily in the Province of Messina (Sicily), is a very active non-profit organization created in 2007. Along its international department EProjectConsult and BrainUp Lab, “A Rocca ” has successfully worked on different European Union funded projects, as well as national projects in the spheres of education, Erasmus placement transfer of innovation, vocational training, youth exchange, project dissemination and evaluation, etc. The Organisation interest, both historically and currently, has been to foster the mutual understanding among different cultures and to increase youth’s international and employment opportunities based on real experience, improving transversal skills and intercultural competences. Our activities are mainly concentrated in the following directions, relevant to European project and Erasmus + priorities: in cooperation with EProjectConsult – Istituto Europeo di Formazione e ricerca, we play the role of intermediary, hosting and sending organization for youth mobility in the frame of Erasmus+. Thanks to our large network of more than 100 companies operating in various sector at local, regional and international level, we ensure the full implementation and success of the project. We work with institutions from all over the world by providing them with full assistance such as: administration, tutoring, placement of students, transfer from/to the airport, accommodation, organization of cultural and social program and excursions across the Sicilian Region, etc. The activities of our organizations are smoothly run by an experienced staff included researchers, trainers and teachers, EU project managers and economist. Writing KA1 and KA2 project, through the time we have successfully worked in different European Projects, developed some successful strategies to run some specific work packages such as dissemination and the evaluation of the project. Also we offer free consultancy on how to write a successful project. “EProjectConsult. Istituto Europeo Formazione e Ricerca” is an Italian NGO established in 2009 that organizes traineeships for around 500 young people a year (both students, teachers and professionals). We are an upcoming and enthusiastic staff, highly committed to spread innovative ideas, creativity and self-development. 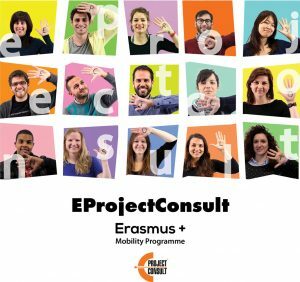 EProjectConsult aims to help people to acquire the means to build their own destiny through the almost endless possibilities the framework of the European Union projects (Erasmus+, Creative Europe, Youth on the Move, etc.). EProjectConsult is mostly specialized in the Evaluation (Assessment) and Dissemination of projects, nevertheless have huge experience in the other areas of the project cycle as well. Through BrainUp Lab, we developed a range of training courses and study visits adapted to the new program of Erasmus+, using as main methodology the non-formal or informal approach of teaching.Are eligible for this training, teachers (i.e. an institution providing general, vocational, or teaching education on any level from pre-school to upper secondary education) and any private or public organization active in the labour market. We also cooperate with “Jalari Park Museum” Cultural Ecological Association which operates at local and regional level with a main objective of promoting tradition, history and culture using all form of arts. Jalari Park Museum is based in an astonishing location on top of the hill of Barcellona Pozzo di Gotto, surrounded by more than 1000 sculptures and original architectures that attract miles of tourist every year. For several years the association has organized meetings, conferences, courses about environment, youth activities and art exhibitions. Moreover, its members coordinate a large number of events such as: Jalari in Corto, Espressivamente, PremioJalari, JalariEtno Fest and other annual Festivals.